Let us share with you the secret sauce of marketing that's been working for us. Marketing can be daunting for small business owners. Trust me, when we first began to learn about online marketing, it was quite overwhelming (face-palm). In today’s fast-paced era where the internet begins to permeate every aspect of our lives, small businesses must become marketing-savvy to compete, sustain and capture new opportunities. The dogma of survival of the fittest applies in the online world too, and it’s probably just as fierce as on the safari. So what to do when your company only has a small budget to spend on marketing? We were asking ourselves the same question too. After much reading and learning, we figure out that even if a business doesn’t have much money to blow on marketing, there are still ways to succeed in getting your business’s name out there. 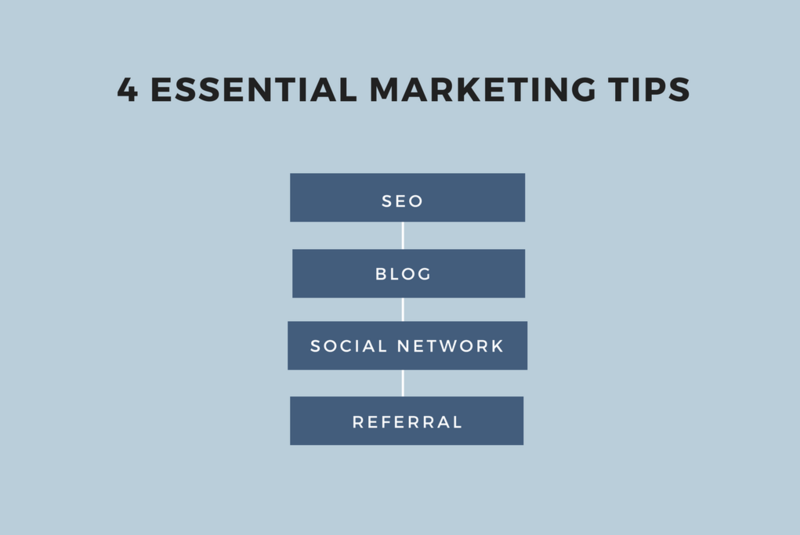 We want to share 4 essential marketing tips with you. We're no marketing experts by all means. But we’ve tried most of these 4 tips. While some of them provided instant ‘gratification’, others need more time to reap the rewards. Not all marketing tips will work, and that’s normal. The key is to find and run marketing tactics that are cost-effective and sustainable for your business. SEO is a term that might be unfamiliar to some of you. It’s okay, I’ve only learned what it is until a few months ago. Not to confuse SEO with SEM (search engine marketing), the former is the unpaid form of advertising while the latter is all about how thick your wallet is. SEO is one of the most efficient marketing methods a business could deploy. When it comes to SEO, search engines are essential as they provide the “soil” for your business’s “seed” to grow organically and be found by prospects. Google is the dominating search engine, raking in about 72% of the world’s market share of online search. Ranking higher on Google through SEO is crucial to bring more traffic to your website. Let's say if you’re running a life coaching business, then you want Google to show your site on the first page of the search result when people type in keywords such as “life coaching” or “personal development coaching”. There are many resources online that provide step-by-step guides to implement SEO. If you want to get started, you can dive deeper by following this beginners guide to SEO or Neil Patel’s SEO Made Simple: A Step-by-Step Guide. SEO is a long-term project that requires time and consistency to score success. But the final reward of SEO is well worth the time investment. Content is the king. We humbly learned that having a blog on a business's website is transitioning from being optional to mandatory. I mean there are people who make a living by blogging. Similar to SEO, it costs $0 to blog! To help your business grow, blogging is an indispensable piece in the marketing puzzle. Plus, writing a blog can be fun. Think of blogging as a form of writing a business diary. It drives more traffic to your website by boosting search engine optimization. One tip we want to share is try to host the blog on your own domain name. We used to host our blog on Medium (a popular publishing platform), but now all the content are transferred to our current CozyCal website. By doing this, each blog hosted on your own website is indexed, thereby increasing your search ranking on Google. Also make sure to not have duplicate blogs on different websites as that would hurt your ranking. Again, there are plentiful of resources online for how to start blogging. No matter what you plan to write, we suggest to keep your customers at the forefront of your mind. Write for them. Give them (healthy) ‘cookies’ and (low-sugar) ‘candies’ in your blog by delivering nutritious, actionable content. If content is the king, then social networks rule the world. Okay, maybe not the entire world, but social networks’ influence over a small business is certainly growing stronger. Studies have shown that over 90% of small businesses are using Facebook as their main social media channel, and over 50% plan to increase investment in Twitter, Instagram and Youtube in 2017. Facebook, Twitter and Instagram are great platforms for small businesses to to increase the reach to customers. Creating profiles on these social networks are fairly straight-forward and at zero cost (unless you start ads campaign then that’s a different story). Not only would these social networks create new opportunities for customers to find you, but they would also be fun because you get to talk and engage with your customers. The hard thing about social networks is you have to maintain being active on them. Running a small business is already hard enough, and on top of carrying out your daily business tasks, facebooking, tweeting, and instagramming would seem to be quite a time-drain. But the key thing is to set clear goals to be successful with social media. Make a plan, target the right audiences and curate your content to satiate the appetites of your customers and prospects. There are many tools (e.g., Buffer) that could help you to streamline your social media. Spend a bit of time to build a social media campaign process. Trust me, it will pay off at the end by bringing more leads to you. Who doesn’t want to spread words for a product or service that they truly love? If your customers are happy, then turn them into your advocates by asking for referrals. A well-organized referral program can incentivize customers to spread the word for you in exchange of perks like a solid discount. More importantly, a good referral program could trigger a ‘domino-effect’ that brings in quality customers and growing revenue. There are many different types of referral programs, but the most effective one is a win-win program that offers benefits to the referrer and the referee. By providing value and incentives for the existing as well as potential customers, the chance of people willing to try your product or service is much higher. One referral program example that we like is from MOO, a business card printing company. Customers are prompted by a step-by-step guide for referral upon completing a payment, which is fairly effective. You can try to embed your referral program after customers finish scheduling an appointment, during check-out or in a newsletter. Once you set up your referral program, tracking will enable you to see whether your referral program is working or not. Google Analytics has a special referral section to track where the leads are coming from. Did I also mention that Google Analytics is completely free? Yes, as a small business, we love free stuff too. There are many online software that help you to streamline the referral program process and track progress, which can get complicated when more customers are trickling in. But these software can not cheap in most cases. We plan to launch a referral program sometime later this year. Instead of using an online software, we plan to experiment a cheaper DIY method which we will discuss more in a future blog post. Marketing should be integrated as part of your daily business routine. Small businesses like us usually don’t have a huge budget to blow on glamours ads and pay-per-clicks that return immediate rewards. But we can win the long-term game by being persistent and creative. Do a little bit of marketing everyday. Tweak that keyword on your homepage for SEO or start to blog regularly. Eventually the incremental changes will add up and make a big difference. Stay calm and market on.